-For water-based application: Acrylic-based primer*/acrylic latex-based exterior grade paint. 1. Lay door horizontally on saw horses or a table. 2. 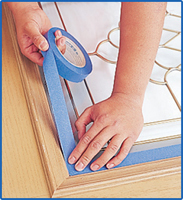 Remove all the hardware and mask off anything you don't want painted, such as the glass insert. 4. Wipe the door with acetone to clean any dust or residue from the surface. 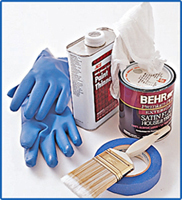 Allow acetone to dry from the surface before applying paint. Do not use hydro-carbon based solvents to clean the surface as such products may leave a residue. 5. Apply primer with a 4" brush beginning with the panels. Follow the manufacturer's instructions for drying time before applying topcoat. 6. The primer must be completely dry before applying any finish topcoat. 1. Apply exterior grade paint with 4" brush in the direction of the grain. 2. 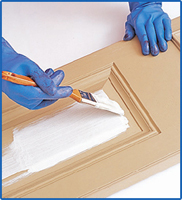 It is common practice to paint both stiles the same color as the exterior side of the door. 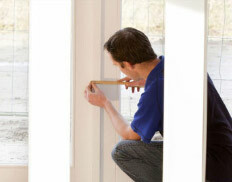 If applying a second coat, follow the manufacturer's instructions for drying time between coats. 1. 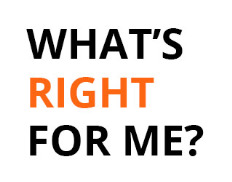 When using stains, mineral spirits, paints or other hazardous materials, always read and follow the manufacturers' products. 2. 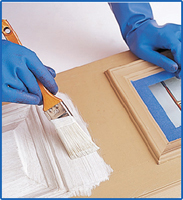 When working with paints or solvents, make sure the working area is well ventilated. 3. Keep away from heat and flame as materials may be combustible. 4. Paints or solvents may cause skin and eye irritation. Avoid contact with skin and eyes.